This is a list of the 100 largest populated places in Libya. Some places in the list could be considered suburbs or neighborhoods of some large cities in the list, so this list is not definitive. Source:Amraja M. el Khajkhaj, "Noumou al Mudon as Sagheera fi Libia", Dar as Saqia, Benghazi-2008, pp. 118-123. Tawarga became a ghost city after Libyan Civil War (2011). 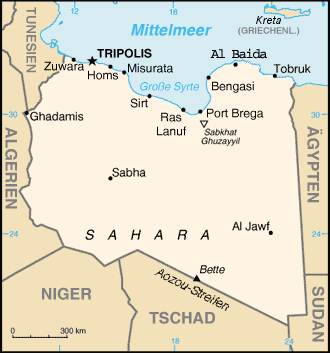 Wikimedia Commons has media related to Cities in Libya.